- Pat the chicken dry with paper towels. Removing any moisture helps when you’re trying to get the skin nice and crisp. - Liberally season all sides of the chicken with salt, pepper, and garlic powder. - If you have time, let the chicken sit in the seasoning for a while and let the flavors get goin. - Heat a drizzle of extra virgin olive oil in a large skillet over medium high heat. - You can test the heat of the oil by wetting your hands under the faucet and spritzing a little water at the pan. If the oil is ready, the water will quickly evaporate and sizzle. 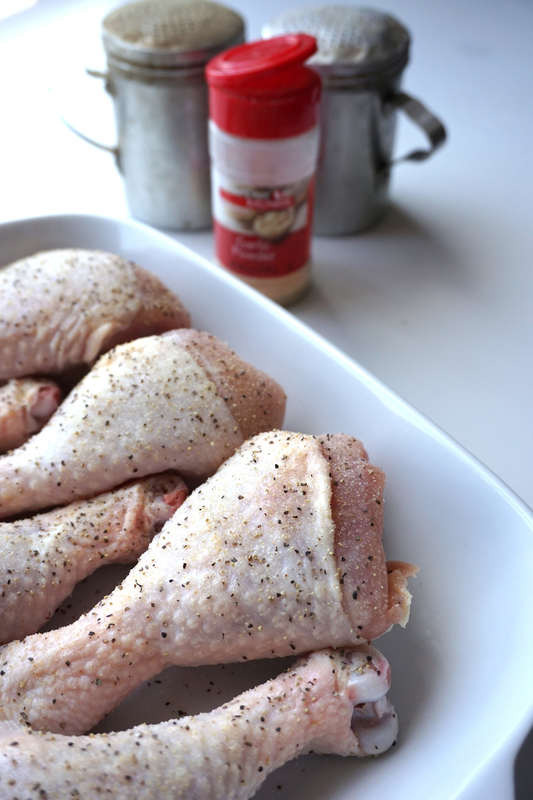 - Using tongs, place all the drumsticks into the pan, giving them a little space to breathe. What we’re going for here is to sear off the skin and get it crispy. You will want to give each side a few minutes to brown. - Browning an odd shape like a chicken drumstick is a little awkward. 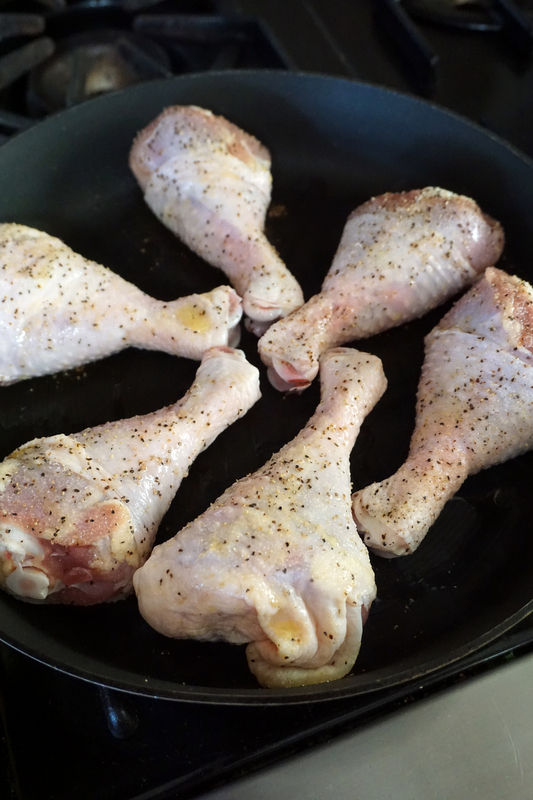 Use your tongs to stand the drummies up on their sides, prop them up against the edge of the pan, do what you gotta do. This is the main chance to get texture into the skin - because once you start basting, it’s harder to get that first base layer of crispiness haha! - This should take about 10-15 minutes. - Once you achieve some good color, you can start basting with BBQ sauce. Start by squeezing sauce onto each drummie, and then using a basting brush, spread out the sauce so it has a nice base layer. 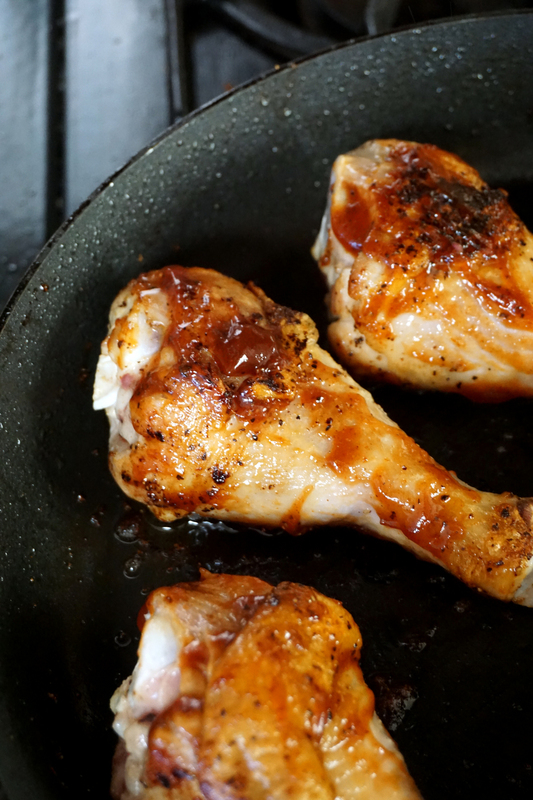 - Let the chicken cook on medium, slowly making your way around the pan and turning each drumstick, adding more sauce, basting, turning…on and on. The sugar in the sauce will definitely burn, but this is also how you start to get that wonderful barbecue flavor. Let the chicken cook for about 10 minutes, and then cover the pan, checking it often to turn the drumsticks and baste them. - For dark meat, we want to reach an internal temp of 165F. I’ve spoken highly of my handy little $7 Ikea meat thermometer that is an absolute god send when it comes to cooking protein correctly. You can set the cook temp at whatever temperature you need to reach, insert the probe into the protein, and the thermometer beeps like crazy when the internal temp reaches the proper temperature. - Cooking the chicken for about 15-20 min or until it reaches temp while covered is key for keeping it moist. - As the chicken starts to reach 165-175, remove the lid and continue turning the chicken. A nice crust will begin to form. I like to continue basting on top of this crust, as that’s how all the nice flavor forms. - Once your meat thermometer reaches the correct internal temp of 165F, Remove the chicken and serve with your favorite sides! I know all that seemed a bit long, but in short, you want to liberally season the chicken, sear off all the skin, turn and baste, turn and baste, and then cook the chicken covered as it finishes reaching proper internal temp. I feel like I can taste it when I’m looking at these pictures haha! This BBQ Chicken turns out being so succulent and fall off the bone. It’s simple comfort food that is incredibly affordable and is a definite crowd pleaser. It takes some attention when it comes to continuously turning and basting, but that helps to get a nice charred crust going. Don’t be skimpy with sauce! Serve some extra on the side as well! What are your families’ favorite Memorial Day eats?